When it comes to grooming, many dog owners only think about giving their pets baths and brushing their hair. While it’s certainly important to make sure that your dog is bathed and brushed, just as important is making sure that his nails are trimmed. While you could have your pup’s nails clipped by a vet or a professional groomer, you can tackle this all-important task yourself with a bit of knowledge and the right pair of clippers. If you’ve never clipped your pooch’s nails before, picking dog nail clippers might seem like a daunting task. There are so many options available, and you want to make sure that you are choosing the best dog nail trimmer possible. To help you make the right choice, we have scoured the market and rounded up what we consider the best dog nail clippers currently on the market. Now that you’ve had a peek at our top five picks for the best nail clippers for dogs, let’s take a closer look at each one. Below, we offer a detailed look at each of these top rated dog nail clippers, including the features they offer and what we like about them. Once you’ve decided which option is the best pet nail trimmer for you and your pup, click on the buttons below each description to find the best prices on Chewy and Amazon. First on our list of the best nail trimmers for dogs is the Dog Nail Clippers and Trimmer by Boshel. These clippers are recommended by vets and professional groomers, so you can be sure that you are using a product that is easy to use and safe for your pup. This dog nail trimmer is ergonomically designed and features non-slip handles, which allows you to get the right grip. The last thing you want to happen while you’re trimming your pup’s nails is to end up being distracted because you’re uncomfortable, or even worse, having the clippers slip out of your hands mid-clip! The blades on Boshel’s pet nail clippers are constructed of stainless steel blades that are 3.5 mm thick. They can easily cut through your dog’s nails with just a single snip, and they’ll retain their sharpness for years. The size is ideal for cutting medium and large breed dogs, such as Beagles, German Shepherds, Belgian Sheepdogs, Bearded Collies, and even Mastiffs! These clippers will offer a smooth, clean, and quick cut each and every time; there’s no need to worry about the nails breaking, chipping, or being jagged after you use these clippers. 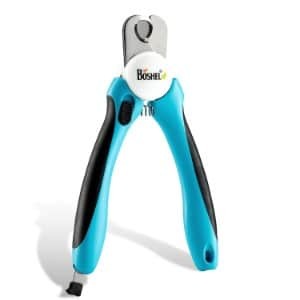 To ensure the safety of your pup, Boshel has outfitted their dog nail clippers with a safety stop blade. This blade significantly reduces the chances of cutting your pup’s nails too short and causing a serious injury. When it comes to trimming your furry friend’s nails, safety is paramount, and with the thoughtful design of these clippers, you can be sure that your canine companion will be safe for each and every manicure you give him. As a bonus, the Boshel nail clippers come with a complimentary nail file. Use this file to smooth out those sharp nails after clipping them, reducing snags and cuts on your legs when your best friend jumps up to give you a lick! 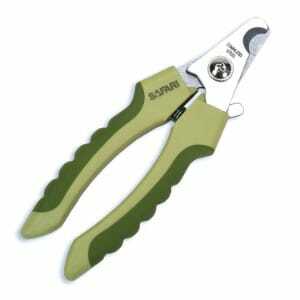 The Safari 770045 Professional Nail Trimmer is available in two sizes: the small-medium size is ideal for small and medium sized breeds, such as West Highland White Terriers, Yorkshire Terriers, and Japanese Chins, while the large size is best for large breed dogs, including Leonbergers, Afghan Hounds, and Antolian Shepherd Dogs. Make sure you determine which size clippers you should be using with your pup before you purchase to ensure the safest, most effective trim. If you aren’t sure, ask your vet or a professional groomer for guidance. Safari is a very reputable manufacturer of grooming products for pets, so you will have confidence knowing that you are using a clipper that is made by a well-regarded company that always has the safety and well-being of your pup in mind. Next up on our list of the best dog nail clippers is the Epica #1 Professional Pet Nail Clipper. These clippers are thoughtfully made to make maintaining your pup’s nails as easy and safe as possible. Epica’s Professional Nail Clippers features top quality blades that are constructed of high-grade stainless steel. They are extremely durable and won’t dull, scratch, bend, rust, or break. They will stay sharp for multiple pedicure sessions, and can easily take on even the toughest nails. And, since the blades are so sharp, they cut precisely, meaning that you can work quickly, which makes them an ideal choice for dogs that are a bit squeamish and don’t like having their nails cut. They’re also outfitted with a safety lock. When you aren’t using the clippers, slide the safety lock in place to avoid accidentally injuring yourself or someone else with the sharp blades. The rubber coated handles will ensure that you can achieve the most comfortable and secure grip possible. The handles are ergonomically designed, too, which further adds to their comfort an ease of use. These clippers are designed for use with medium and large breed dogs; they are not ideal for use with small breeds, like Chihuahuas, as they are just too large for their delicate nails. For small breeds, you should opt for a clipper that’s designed for small dogs to ensure safety. Millers Forge is one of the most renowned names in the pet grooming supply industry. They are known the world over for making high-quality, durable products. The Millers Forge Quality Nail Clipper is a scissor style clipper. They feature extremely sharp stainless steel blades that won’t rust, bend, crack, or dent. 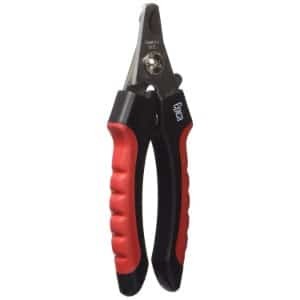 These trimmers will also retain their sharpness for years to come and will always provide a thorough trimming on even the toughest nails and the largest breeds. With that said, we consider this one of the best large nail dog clippers; they are recommended for dogs who weigh at least 40 pounds. While these blades on these clippers are outstanding, some users expressed concern about the handles. The handles are very basic and are wrapped with a thin layer of plastic. This means that these dog nail trimmers are best for people who have experience trimming a dog’s nails and are comfortable with the process. Also, these trimmers do not have a quick guard; however, for some people, that may be a benefit. A lot of people believe that a quick guard blocks their view while trimming, which can be detrimental. There is, however, a locking mechanism that will allow you to secure the blades in a closed position when they are not in use. Last, and definitely not least, on our list of the best dog nail clippers is the GoPets Nail Clippers for Dogs. These trimmers feature 3.5 mm thick durable stainless steel blades, so there’s no need to worry about them rusting, denting, or becoming damaged in any way. The blades also retain their sharpness for a long period of time, so you will be able to achieve fast and efficient cuts, which makes these clippers a great choice for dogs that have thick nails and who tend to be a bit squeamish. The handles on these dog nail trimmers feature rubber grips, which provide a more comfortable and secure fit. Additionally, the handles on these clippers are a bit longer than the handles on most other trimmers we’ve seen. That extra length provides more leverage, which makes it even easier to trim your pup’s nails. A built-in guard will prevent you from accidentally clipping off too much of your dog’s nail; however, if you would rather not use the guard, you can easily flip it so that it won’t be in your way. 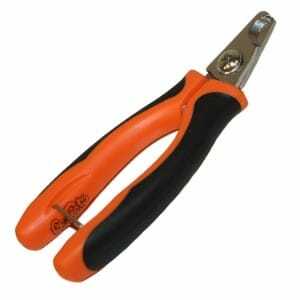 These clippers also feature a locking mechanism, so you can keep the blades securely closed while they are not in use. The GoPets Nail Clippers for Dogs are available in two sizes: small and large, so you will be able to choose the right one for your pup’s specific size and needs. Making sure you choose the absolute best products for your dog is important to you; after all, your dog is more than just a pet; he’s a member of your family! In an effort to ensure that you are providing him with the very best of care, doing extensive research before you invest in a dog product is vital. This includes products like a dog house, a dog bed, a dog crate, a dog playpen, and an outdoor dog kennel (if you’re using these products). It also means talking to your vet to find out what the best dog food is so that you can ensure you are meeting your furry family member’s nutritional needs, as well as taking the time to determine which type of dog collar or dog harness will work best for your pooch. Since you put so much time and effort into finding out what products are the best for your canine companion, it only makes sense that you should invest as much time and effort into buying the best dog nail clippers. If you’ve never trimmed a dog’s nails before or purchased clippers, keep on reading to find out valuable information about this all-important grooming task. Below, we highlight important features in dog nail clippers, the different types of nail clippers for dogs, why choosing the best dog nail clippers is so important, and even offer some tips that will help to ensure you are cutting your pooch’s nails as safely as possible. First things first: let’s review the different types of dog nail trimmers. Believe it or not, there are several different designs available, so here’s a breakdown of each type and what works best for different types of dogs. 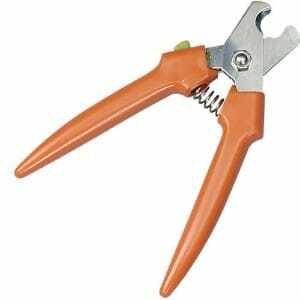 As the name suggests, scissor nail clippers work in the same manner as a pair of scissors that you would use to cut paper. These clippers are considered the best option for medium and large breed dogs, as they have larger and thicker nails that require extra force when clipping them; and that’s exactly what scissor a scissor trimmer offers. These clippers work much like a guillotine does; the end of a pup’s nail is inserted through a hole on the clipper, the handles are squeezed, and a blade lowers down onto the nail, gently cutting it off. Guillotine nail clippers are well suited for small and medium dog breeds, as they offer enough force for their nails and are easier to wrap around their nails. Another nail trimmer option is a grinder. Instead of actually cutting the nail, these trimmers grind the nails down. Grinders are best suited for large dogs with thick nails that may not be able to fit into scissor or guillotine style clippers; however, it’s important to note that you should feel very comfortable using this tool and that your dog should be well-trained. If you are thinking about using a grinder, you might want to consider investing in a dog training book before you use this tool so that you can make sure he understands important commands, like sitting and staying. Trimming your dog’s nails is extremely important; in fact, it’s vital for his overall health and well being. Just like your nails continue to grow, so does your dog’s. In the wild, those nails would wear down naturally as he was walking or hunting; however, since he is domesticated, his nails won’t naturally wear down, which means that you are going to need to trim your furry friend’s nails for him. If your pup’s nails are left to grow, a number of problems can arise. They can chip and break, they can be extremely uncomfortable to walk on, and they can snag on carpeting, furniture, or even on cooling pads for dogs (if you use them). Long nails could also make it difficult for your furry companion to do the things that he loves, like playing with puzzle dogs for toys or interactive dog toys. In extreme cases, if the nails grow too long, they can actually curl under your pup’s feet and can actually become embedded into the paws. If that happens, not only would your pup be in extreme pain, but there’s also a risk that he could develop an infection, for which medications for dogs would be needed to treat. While trimming your pup’s nails is exceptionally important, it’s also a task that requires extreme care and patience. Inside each of his nails is a vein. If you cut his nails too short, you could cut through this vein, which could result in severe bleeding. Therefore, in order to avoid harming your pup, you want to ensure that you are using the vest best nail trimmer for dogs possible. So, since you want the best for your dog (and you certainly don’t want to hurt him), you are definitely going to want to invest in the very best dog toenail clippers you can find. While there are a lot of dog nail trimmers on the market, not all of them are created equal. Some of them are made of cheap materials, are difficult to operate, and can actually end up doing severe damage to your pup’s nails. Stainless steel blades. The best dog nail trimmers will feature stainless steel blades. Stainless steel is the most durable metal that dog nail clippers can be made of. This material doesn’t crack, chip, break, dent, or rust. It also retains its sharpness for multiple cuttings so that you can ensure a smooth, even cut each and every time. Comfort grip handles. When you’re cutting your dog’s nails, you want to make sure that you have the most comfortable and secure grip possible. If not, you run the risk of losing your grip, which increases the chances of injuring your pup – or even yourself. With that said, the best dog nail clippers will feature comfort grip handles. They are designed so that they are comfortable to hold and are wrapped with a non-slip rubber material. Safety features. The best nail clippers are also outfitted with safety features. These features can include guides that will prevent you from cutting your dog’s nails too short, as well as locks that will allow you to store the clippers in the closed position. Easy to clean. Lastly, the best toenail clippers for dogs should be easy to clean. Just like you should clean all grooming tools that you use with your dog, like a dog brush, you should also clean the clippers that you to trim your pup’s nails. It’s also important to note that, when choosing a nail clipper for your pup, that you choose the correct size. While size isn’t exactly a feature, it’s a crucial. If you have a large dog, his nails are going to be bigger and thicker, and therefore, you will need a pair of clippers that can easily handle his nails. If you were to use a clipper that’s too small to accommodate his nails or doesn’t offer enough power, you will run the risk of injuring your furry friend. The same is true for small dogs; using clippers that are meant for large dogs on a small breed could also result in injuries, as you could end up cutting off too much of his nail. Introduce the clippers to him before you start cutting them. You don’t want your pup to be frightened when you actually start using them. You want to show him that the clippers are nothing to be afraid of. Hold your pup’s food steady, yet gently. You don’t want him to be able to pull his paw away, but you don’t want to harm him. Clip off only a small portion of the end of each nail. If you notice a spongy-like feeling, do not proceed! That means that the quick, the vein that is located in his nail, is in the clipper. Be prepared for any accidents. Despite your best efforts, there’s a chance that bleeding could occur. Keep styptic powder, which instantly stops bleeding, on-hand whenever you are trimming his nails. Trimming your dog’s nails is one of the most important parts of grooming. In order to ensure that you are doing the job correctly and that you don’t injure your best friend, make sure that you are using the best nail clipper. The dog toenail trimmers mentioned in this guide are all excellent options to consider, as they are all made of high-quality materials and they have all been crafted with safety and comfort in mind.